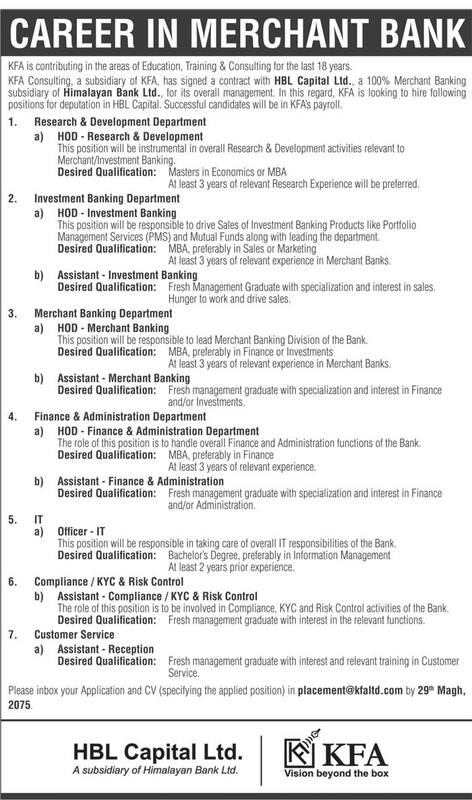 Jobs at HBL Capital, a subsidiary of Himalayan Bank Ltd.
KFA is contributing in the area of Education, Training & Consulting for the last 18 years. This position will be responsible to drive Sales of Investment Banking Product like Portfolio Management Services (PMS) and Mutual Funds along with leading the department. > At least 3 years of relevant experience in Merchant Banks. > Fresh Management Graduate with specialization and interest in sales, Hunger to work and drive sales. This position will be responsible to lead Merchant Banking Division of the Bank. > Fresh management graduate with specialization and interest in Finance and/or Investments. > Fresh management graduate with specialization and interest in Finance and/or Administration. This position will be responsible in taking care of overall IT responsibilities of the Bank. > Fresh management graduate with interest in the relevant functions. > Fresh management graduate with interest and relevant training in Customer Service. Please inbox your Application and CV (specifying the applied position) in placement@kfaltd.com by 29th Magh, 2075. A subsidiary of Himalayan Bank Ltd.
KFA Vision beyond the box.